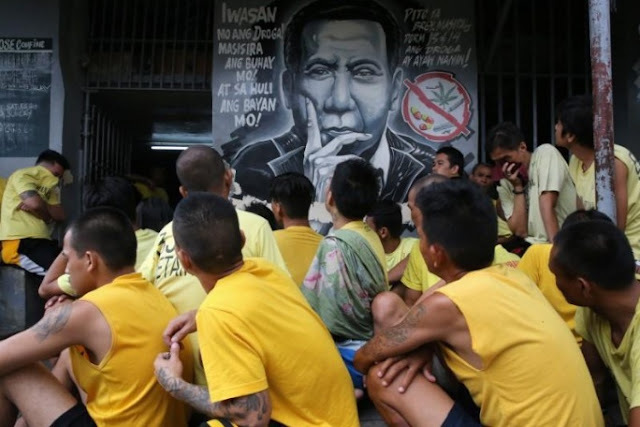 Detainees sit next to a mural of Philippines President Rodrigo Duterte while authorities search through belongings for illegal contraband inside the Manila City Jail in metro Manila, Philippines October 16, 2017. The words on the mural read "Steer away from illegal drugs to save your life and in turn, will save the country's". MANILA - Nearly nine out of 10 Filipinos support Philippine President Rodrigo Duterte’s war on drugs, and almost three quarters believe extrajudicial killings are taking place in the bloody crackdown, an opinion poll showed on Monday. Duterte’s signature campaign has killed thousands of Filipinos and caused international alarm, amid widespread allegations by activists that police are executing suspected drug users and dealers. Police reject that and say every one of the more than 3,900 victims in their anti-narcotics operations were killed because they were armed and had violently resisted arrest. Eighty-eight percent of the 1,200 Filipinos surveyed by pollster Pulse Asia last month said they support the anti-illegal drugs campaign, with nine percent undecided and two percent against it. But 73 percent of respondents believed extrajudicial killings were taking place, up from 67 percent in the June poll. A fifth of Filipinos felt there were no such killings, as the authorities maintain, down from 29 percent in June. The issue of extrajudicial killings is contentious in the Philippines, where definitions of what it means vary from those typically used by international organizations and human rights groups. Pulse Asia in its survey defined the term as “killings done by people in authority, such as the police or soldiers, that do no follow the rule of law”. Political analysts Ramon Casiple said the survey showed support for the crackdown from those who felt crime was being tackled, but reservations among those most affected. “Communities with reported deaths, generally urban poor communities, are getting increasingly concerned of the killings,” he added. The survey comes amid unprecedented scrutiny on the war on drugs and several opinion surveys by another pollster that indicated dwindling trust of police accounts of operations, and whether victims were indeed all drug dealers as police maintain. Duterte last week ordered police to withdraw from the anti-narcotics campaign and leave all operations to the Philippine Drug Enforcement Agency (PDEA) following scrutiny of police conduct. He noted fewer killings in operations by PDEA, an agency a fraction of the size of the police, and said he hoped critics and “bleeding hearts” would be satisfied by his decision. Nearly nine out of 10 Filipinos support Philippine President Rodrigo Duterte’s war on drugs, and almost three quarters believe extrajudicial killings are taking place in the bloody crackdown, an opinion poll showed on Monday.